Eastern Visayas is not only about the National Maharlika Highway that connects Luzon and Mindanao. But this region, through Samar, the country's third largest island, offers a perfect destination for people who seek fun and adventure. Samar in Eastern Visayas is a place yet to be explored. But it is ready to amaze visitors with its magnificent caves, beautiful waterfalls, inviting pristine waters, historical places, and other sceneries in their most-preserved forms. Samar is composed of three provinces: Western Samar, which is the “mother” province as well as Northern and Eastern Samar. Tourism regional director Karina Rosa S. Tiopez told the Philippines News Agency that Eastern Visayas has varied potentials. Samar is ahead when it comes to adventure, with its caves as among its prominent attractions. Samar hosts the biggest cave system in the country and second in Asia: the Langun-Gobingob caves in Calbiga town. “You’ll find caves dotted all around the island of Samar,” she said, adding the pristine carves are even comparable to the size of the island of Cebu. These caves, she said, have different sizes, making available various levels of challenges; some are not even fully explored yet including that of the Langun-Gobingob. On the other hand, Sohoton Cave in Calbayog City is dubbed as “cave for all ages” and is the most accessible because of its proximity to Tacloban City, the region’s gateway. The cave has a flat terrain with three chambers where stalactites, stalagmites and rock formations are preserved, she added. A tour of the cave takes around an hour. Calbayog is also known as the “city of waterfalls” and the local government unit is bent on developing Bangon Falls as one of its priorities, she disclosed. Meanwhile, one can experience an adrenaline rush with the Ulot River Torpedo Extreme Boat Riding in Paranas town. It is an adventure that offers a downstream and upstream ride using a motorized dugout boat without an outrigger, only at the longest river of Samar island. Only 10 kms of the river though is being utilized for the ride. The escapade, however, is not only about enjoyment but a glimpse of the way of life of Samarnons. 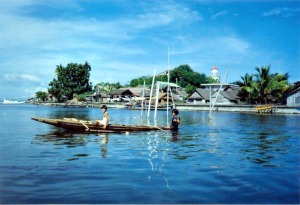 During the early years people had to navigate passing the Ulot River using the torpedo-shaped when there was no formal road network that connect Eastern and western Samar, she added. On the other hand, visitors should never miss out on the four island towns of Northern Samar, each with a different character to showcase. Biri has its five rock islets; San Antonio has spots for snorkeling, swimming, kayaking; San Vicente with its pink sand beach; and Capul, which used to be stopover for galleon ships doing trade between the Philippines and Acapulco, Mexico, for its white sand beach. Capul has its 17th century church and a light house that was made by the Americans during World War II. Tiopez said that these island destinations are being paired with mainland towns that serve as their jump off point. For instance, Biri is being paired with Lavezares town, which is now developing a kayaking activity along its mangrove area not to mention its high potential for bird watching. Eastern Samar, on the other hand, will not be left out with the Calicoan Island of Guian town that is now dubbed as a surfing destination. “It has the best of both worlds; part of the island facing Leyte Gulf has the biggest potential to be developed into resorts because the sea is calm. Facing Pacific Ocean is the best side for surfing,” she said. She added that surfing enthusiasts like the waves in Calicoan because they come from both directions. It is the favorite destination of surfers, especially foreigners, from July to September and even when there are typhoons. Tiopez added that visiting these places or in other parts of the region is not difficult with the Dept. of Public Works and Highways doing appropriate actions should there are problems in the road network. She also disclosed that through their tourism road map they looked forward to address the problem on accessibility especially that “large majority of natural attractions” lack the last mile access road. Other identified destinations though can be easily reached already. Also getting to these places from outside of the region is not difficult with direct flights from Manila, Cebu and Iloilo to Tacloban City as entry point. They may also opt to fly direct to Catarman in Northern Samar or via Guian airport in Eastern Samar. Meanwhile, DOT’s efforts to promote these provinces as destinations are picking up, according to Tiopez. In Samar based on actual data provided by local government units to the DOT as of October last year, various destinations were visited by 2,883 guests; 3647 in Eastern Samar and 5631 in Northern Samar. More than 73 percent of the guests were domestic tourists while the rest were from Japan, America and some parts of Europe. With destinations identified and already in place, the tourism department is looking forward to hurdle the image that was painted of the place when it comes to peace and order situation.